W ith the new 2018 tax laws in place, Proposition 13 will once again fall under the microscope of many politicians and homeowners. With the average property in San Carlos now valued at close to $2,000,000, and the elimination of many traditional tax deductions that will severely limit the ability to write off property taxes, expect Proposition 13 to once again encounter strict scrutiny. Proposition 13 is known by many Californians as the measure that keeps their property taxes from accelerating at the market rate of home values. However, it’s much deeper than that. There is a lot of mystery that surrounds Proposition 13 for many homeowners. Many long time homeowners have benefited. The ones who truly lose out are those who recently purchased property and our schools. Many in San Carlos do not understand how our schools could be in dire need of funding each year given that property taxes are well over $20,000 a year for the average, newly purchased San Carlos home. Conversely, many wonder how Palo Alto schools have done so well and are able to take better advantage of property taxes for their schools. 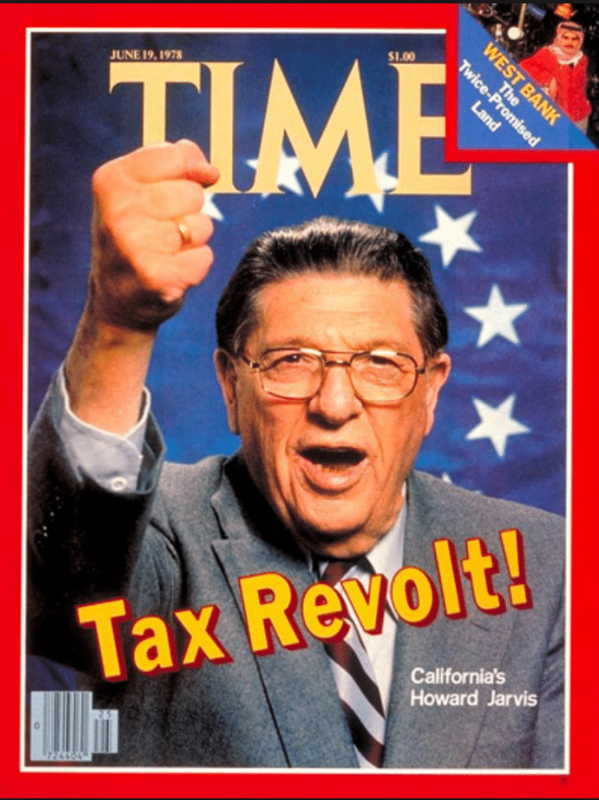 In a surprising result in the election of 1978, the Proposition 13 Tax Amendment, otherwise known as the “Tax Payer’s Revolt” was officially made part of the California Constitution. In its simplest form, Prop 13 limits property tax rates to no more than 1% of the property’s full cash value. Any increases in value are capped at 2% or the percentage growth in the Consumer Price Index (CPI). For example, in 2017, the increase was 2.48%. It has been less than the 2% cap only six times in the last thirty years. San Carlos was heavily skeptical that Prop 13 would pass. However, in the event that the proposition passed, the city wanted to make sure that it was prepared. First, it is helpful to understand that San Carlos was only a shadow of its current self in 1978. Many current San Carlans would struggle to recognize the town. San Carlos was more of a blue-collar town in south San Mateo County at the time. Additionally, San Carlos was a town that had been closing schools rather then opening new ones, due to a lack of enrollment. The city decided that it in order to have its property taxes remain as low as possible, the portion or percentage of property taxes which were to be earmarked for our schools was to be relatively low compared to other cities and districts that had increasing enrollment rather than decreasing enrollment. Cities knew that if Prop 13 were to become law it would essentially, temporarily freeze the disbursement rates that cities were using for determining the share of property taxes to be used for its schools. In order to make sure that the city was not losing a higher percentage of their property taxes to a district that was being underutilized, the city looked to reduce that disbursement rate in the event Prop 13 passed. The key to understanding the position of San Carlos and most other peninsula cities back in 1978 centers around the idea that Prop 13 was meant to be a band-aid and very temporary in nature until the state legislature could come up with a far more comprehensive plan. San Carlos saw this as an opportunity to have a minimal percentage of their property taxes diverted toward its schools at a time when enrollment was quite low and thus stack other city projects with the revenue. The Tax Payer Revolt worked and Prop 13 became law. However, where the vast majority of cities and school districts in California lost was when it became evident that the band-aid or temporary fix that is Prop 13 was never repealed and 40 years later, that low, now permanent disbursement percentage from property taxes crippled school districts around the state. This rate has never changed, thus it has been incredibly difficult for our schools to keep up financially. Further, it is legally impossible for San Carlos and cities similar to San Carlos to change their disbursement percentage from pre-1978. However unfair this may seem, it’s a reality that our district has had to deal with for the last 40 years. At the same time as the implementation of Prop 13, a very famous California Supreme Court case was decided. The final ruling in Serrano v. Priest, stated that the State of California had an obligation to equalize the disparities in the funding of California School districts. The result was a political compromise. Essentially, the all school districts in California were given a choice: (1) districts with very high property taxes and higher percentages of those taxes then allocated to schools could opt to be self-funding from their property taxes, with very little help from Sacramento (as long as they could prove viability); or (2) districts could agree to essentially forego the heavy dependency on their local property taxes and join the revenue stream from the state budget. Almost all of the districts opted to be a part of the state budget to secure a minimum level of funding each and every year. In fact, out of the 1,000 plus school districts in California, only 65 went with choice #1, and became what is referred to as Basic Aid Districts . San Carlos was one of the 950 or so districts that went with choice #2, as their current “frozen” percentage of property taxes available for school usage was not sustainable to operate the district in the years that were upcoming. They were then forced to accept the minimum level of funding from the State of California. An example of one of the 65 districts which did not lower their property tax disbursement rate to the schools in anticipation of Prop 13 was the Palo Alto Unified School District. They were one of the few to go with Option 1 and thus had a much more hefty revenue stream from property taxes going to their schools. This very fortunate decision made by Palo Alto leadership in the late 1970s would set the city up for many years of prosperity as it related to their school district. As housing prices continue to escalate, teachers and other public servants will eventually require more assistance from their schools to find local housing. With Proposition 13 holding San Carlos to minimal funds from the State of California to survive, one has to wonder how much longer Proposition 13 will continue to survive without serious legislative competition.